Whether for a celebration, catching up with friends, or for family bonding time, Americans love going out to eat. While this is fun every now and then, it can take a toll on your budget. In fact, the average American spends $3,000 a year on dining out! This may seem obvious option, but most people don’t take the time to look for coupons. Look at your local paper or radio station online. They often post coupons from their local advertisers. Check out apps such as GroupOn or, if you’re a student, PocketPoints. There are always discounts for food on these apps. 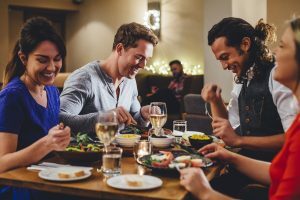 It may seem silly to eat before you go out to eat, but if you snack on something beforehand, you’ll spend less at the restaurant. You won’t feel the need to order the dinner entrée like you normally would, instead, you may only be hungry enough for an appetizer. Alcohol can add up to 50% to a bill. A couple of beers and an after dinner drink and you’ve spent more than your entrée. By avoiding the alcohol you can walk away with a much smaller tab. There are even some restaurants that allow you to bring your own liquor for free or for a small corkage fee. All the fun without the bill. Research if this is available in your region. If you have the time, try meeting your friends for lunch instead of dinner. Lunch menus are more often than not, cheaper than dinner menus. Also, lunch time tends to be less crowded at restaurants so you might enjoy your meal more. Meet up with them later. Another option would be to find your friend group after dinner. For example, if they are planning on having dinner and movie, maybe find them at the theatre instead to cut the costs. Or better yet, suggest a movie night in to save even more money. Consider hosting a potluck with your friends. You save money by not going out and still enjoy the company of your friend, maybe even more so in a relaxed home atmosphere. Also, who doesn’t love a potluck? If you still find yourself struggling to manage your money after these tips, please give Credit Advisors Foundation a call to set up a debt management plan.